"If Robert Plant coulda singed like that, Led Zeppelin might have even sold a few rekkids." It’s hard to fathom a time when Jack White didn’t sit atop of music’s Mount Everest as the most pivotal, divisive figure in rock and roll. However, in 1999, Jack and Meg White were still relatively unknown commodities upon releasing their self-titled debut. 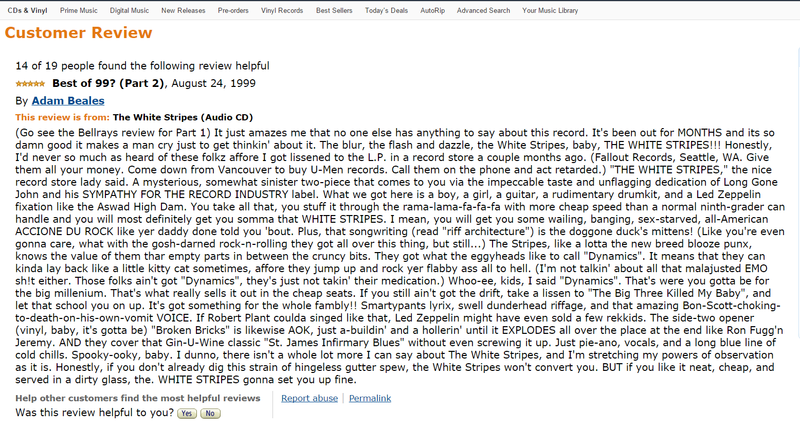 Case in point: this absolutely hysterical review posted to Amazon.com by a fan named Adam Beales months after the release of The White Stripes. Read the review in full below. It also still lives on Amazon.com. Adam Beales, modern day Nostradamus.